This entry was posted in Blog Hops, Penny's Tips and tagged Comedy Plus Happy Tuesday Blog Hop, Giving Tuesday, gofundme, Penny, Penny's Tips by pilch92. Bookmark the permalink. That’s a perfect tip for Giving Tuesday! Can’t blame you for being sleepy … or for using the heating pad! Thanks for the reminder, Penny! That is a very good and thoughtful tip for today, Penny. I was very sad to hear of Lucky’s passing. You look very comfy on that heating pad Penny! We did not know Lucky but we know Marg has so many animals she cares for and it sounds like Lucky really WAS very lucky to find her and have nine happy years with her. GIVING TUESDAY hopefully will be as HUGE as CYBER MONDAY was…….or even BETTER! That heating pad sure makes you look comfy, Penny. And what a lovely tip. Excellent tip! We have the electrician coming again today, so our pennies (and dimes and nickels and dollars) have to go to him, i hope to give something to her soon. I hope it isn’t too expensive- I know electricians can be pricey. I cannot tell you how much it meant to all of us to donate in Lucky’s memory. That was just the best. Thanks so much for doing this. You all are just the best. Thanks for the reminder about Giving Tuesday! Have a lovely day snoozing! I did not know about Giving Tuesday. Didn’t know lucky but I am so sorry for Marge. A heating pad is a wonderful thing, Penny! Good tips, Penny but sad news about Lucky. So much fundraising today! Penny, that is a good tip! The corporation that I work for also matches any donation that I make to a non-profit, so that’s double! We have the sads about Lucky. That is a nice corporation. Happiness is being warm. You’re succeeded. Cute. I was very sad for Marg losing Lucky. I donated as soon as I heard. 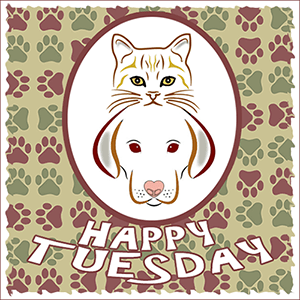 Thanks for linking up to Happy Tuesday. And your heating pad is an real good idea. I want one for Christmas. Another loss? How sad. Thanks for the reminder and be well. Every penny counts, especially when it goes to a good cause like Marg’s Animals – we gave a little bit too. We are so sad about Lucky, but he had a good life there with Marg and the other kitties. Oh gosh, I bet that heating pad is so warm and cozy! That’s a good tip. Every little bit helps. Ooh Mudpie wants a heating pad! Penny, that’s the best tip ever. sorry to hear about Lucky! Thanks for reminding me to get the heating pads out! Oh, you do look very comfy, Miss Penny. We were so sorry to hear of another kitteh’s passing. Our purrs and prayers are with Marg. And your tip is absolutely purrfect, Penny. Any little bit that people have to offer can go a long way. Warm wishes! That heating pad would make us sleepy too!